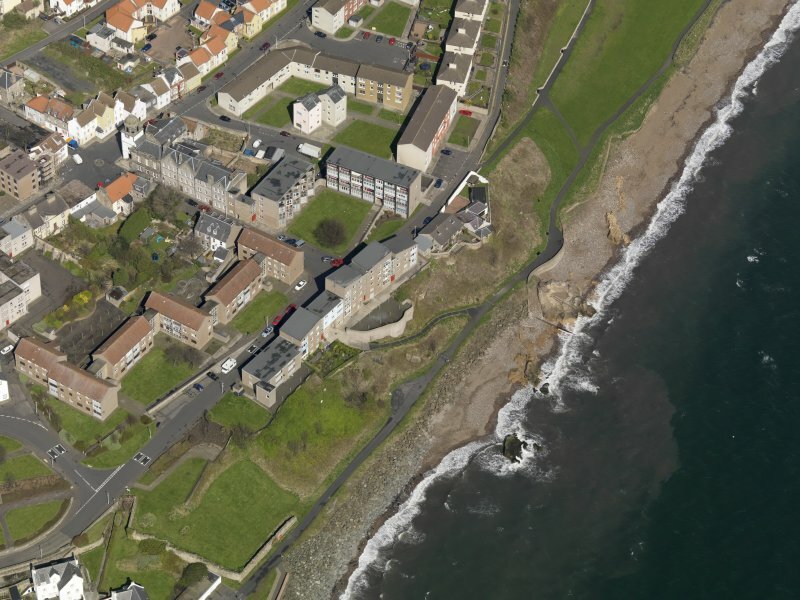 Oblique aerial view centred on the Wheeler and Sprouson flats, taken from the SW.
View of entrance and 1576 date stone, Tolbooth, Dysart, from W.
View of the Tolbooth, Dysart, from W.
Oblique aerial view centred on the Wheeler and Sprouson flats, taken from the SE. 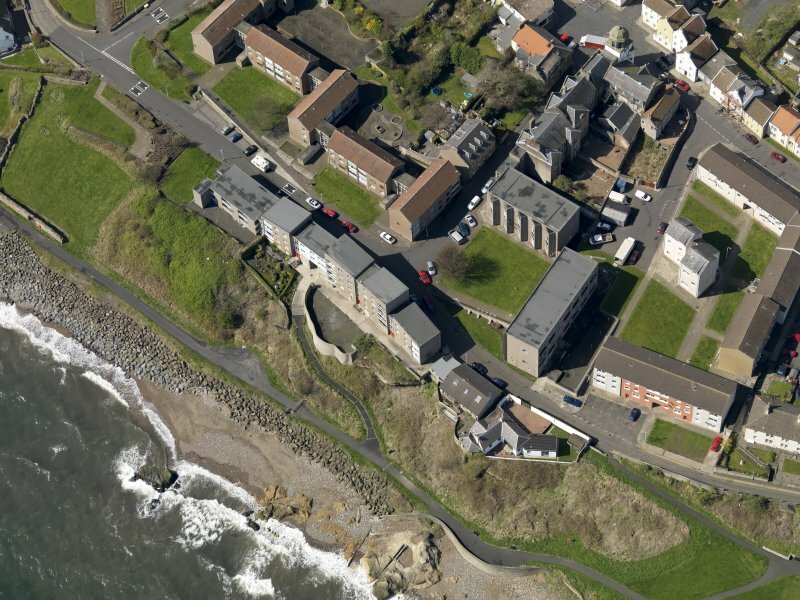 Oblique aerial view centred on the Wheeler and Sprouson flats, taken from the SSE. 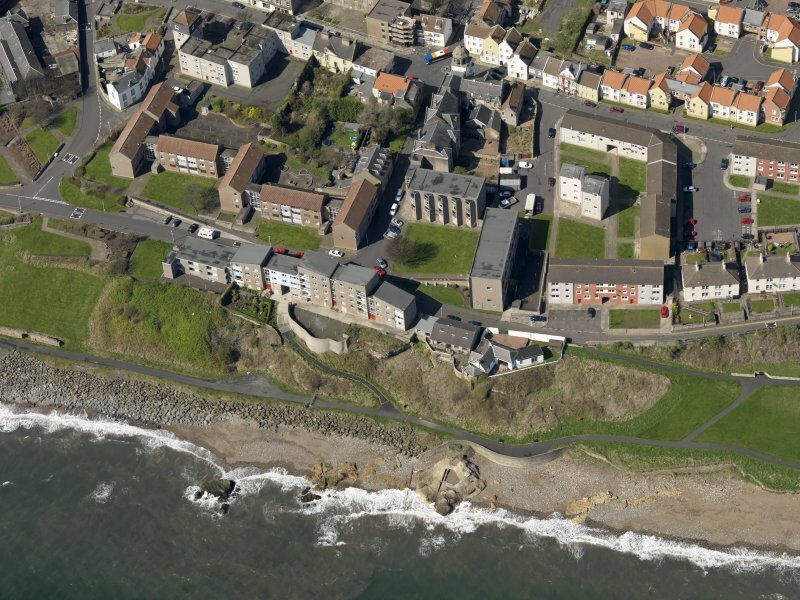 Oblique aerial view centred on the Wheeler and Sprouson flats, taken from the E.
Oblique aerial view centred on the Wheeler and Sprouson flats, taken from the S.
Oblique aerial view centred on the Wheeler and Sprouson flats, taken from the NW. 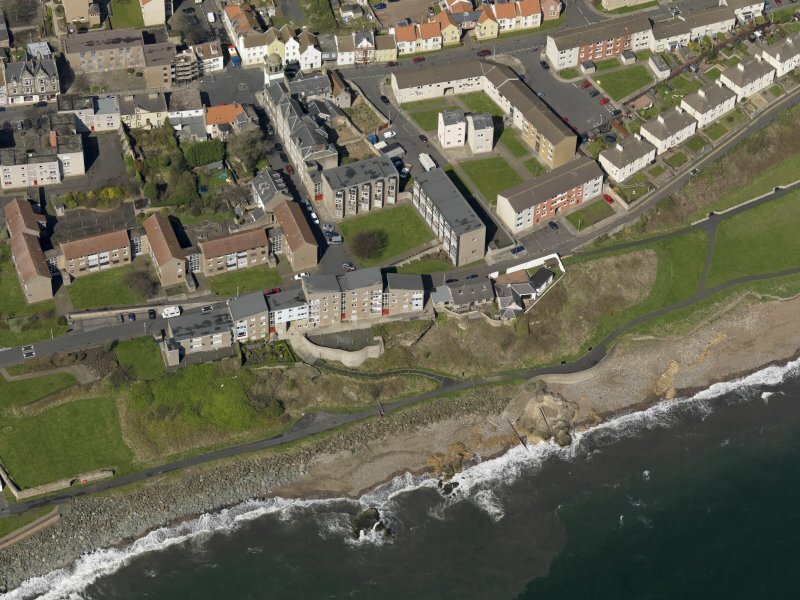 Oblique aerial view centred on the Wheeler and Sprouson flats with Howard Place adjacent, taken from the SSE. Interior - second floor, eastern barrel vaulted cell, view from east. Digital image of B/39469. Inscription on bell. Preparatory drawing for 'Tolbooths and Town-Houses', RCAHMS, 1996. 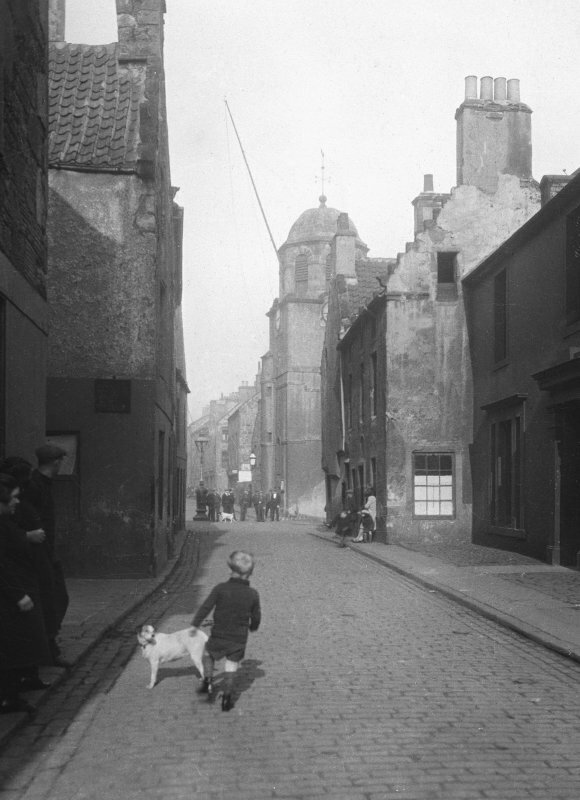 N.d.
View of the Tolbooth, Dysart, from SW. 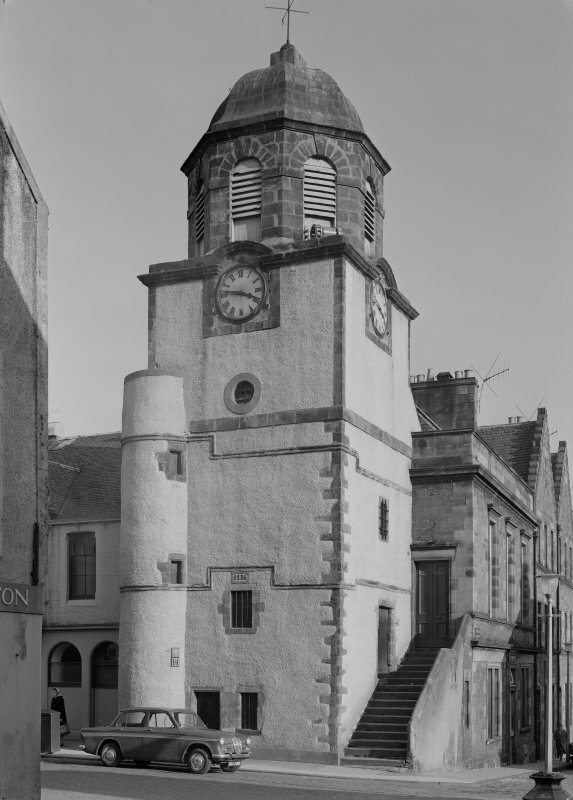 The tower of the Tolbooth dates, as a panel on the front shows, from 1576. The tower is roughly square, with a stair-turret projecting from the NE angle, and has a forestair built against the south side. The forestair is an addition and carries a panel dated 1617. The upper part of the tower was reconstructed in the 18th century. 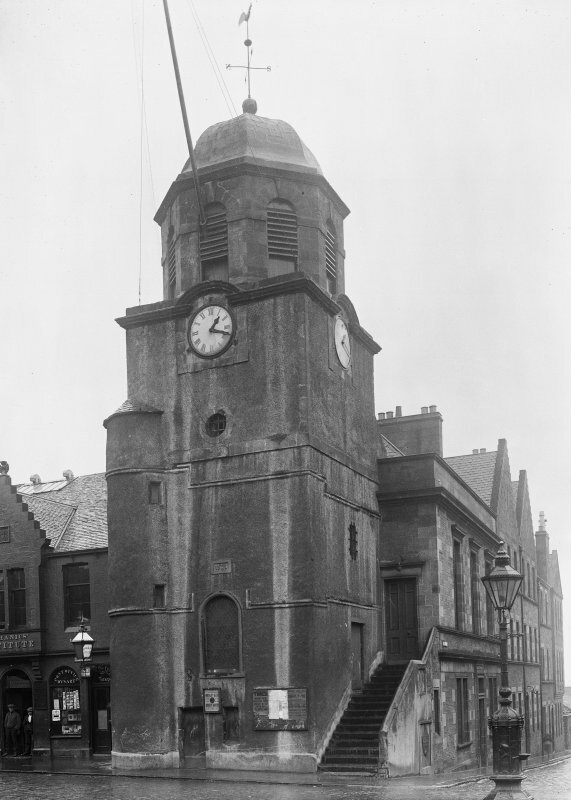 The town hall which dates from 1617, although blown up by Cromwell's troopers, still retains its massive old tower or tolbooth. NT 3041 9316. 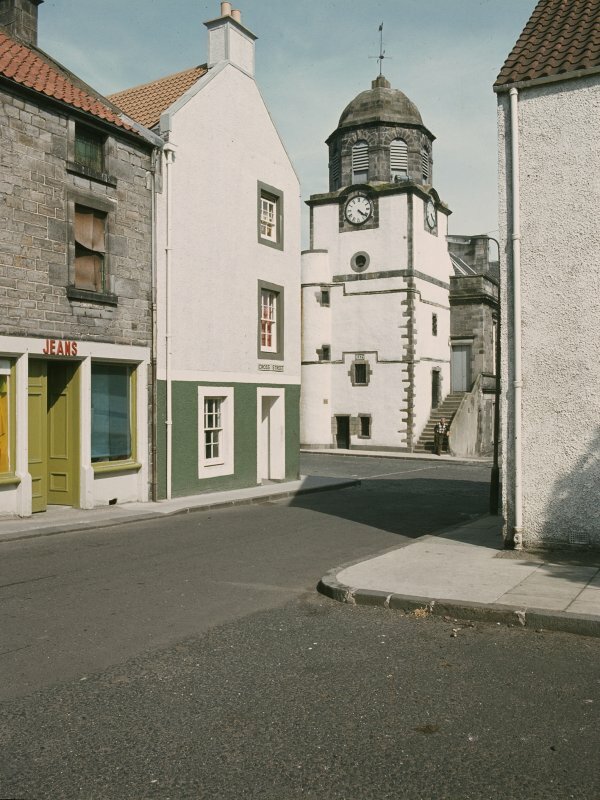 The Tolbooth is as described above. It has been completely harled, showing no old masonry. 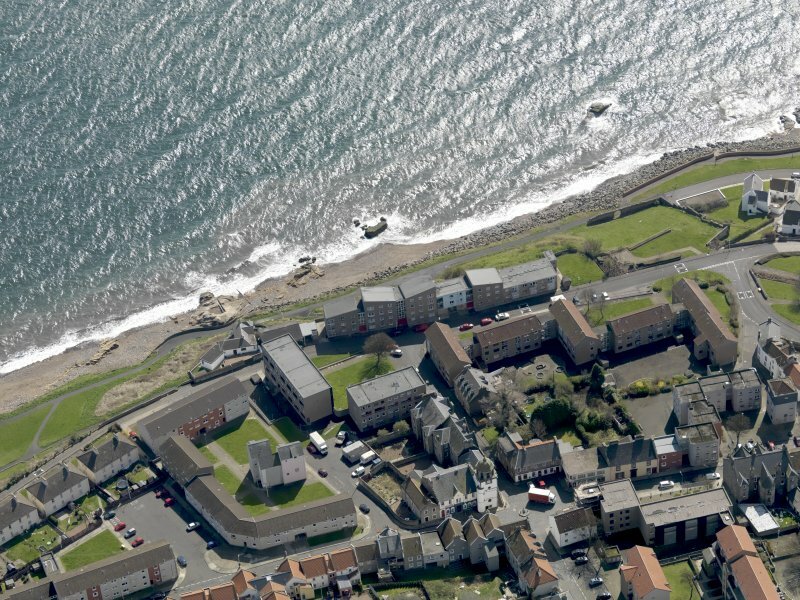 The Town House, directly adjacent on the north-east has been rebuilt and is of no archaeological interest. Visited by OS (J D) 5 October 1954. W Muir 1853; G Stell 1982. ARCHITECT: Campbell Douglas & Sellars, 1885 (additions). Non-Guardianship Sites Plan Collection, DC23458, 1948. 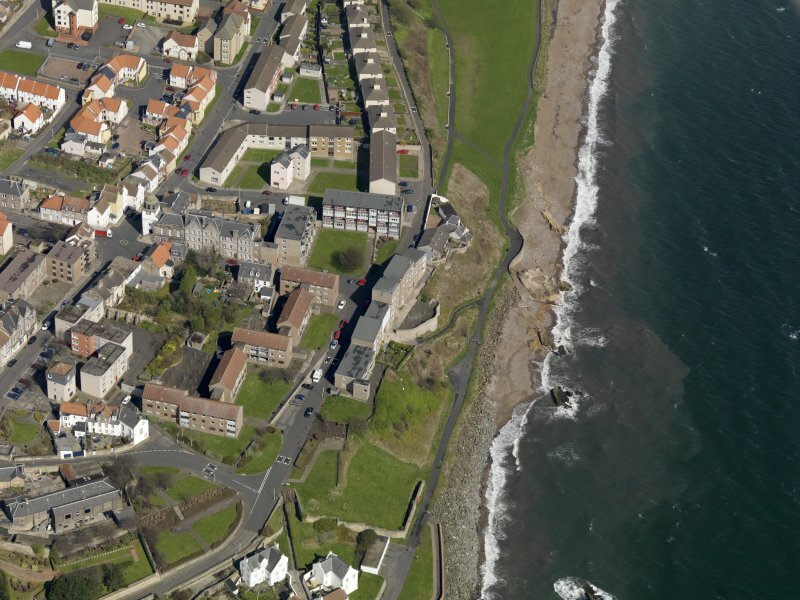 Dysart became a burgh of barony in 1549 and the tolbooth appears to have been erected in 1576. It took the fonn of a square-plan tower-house with a stair-turret projecting from the north-east angle. 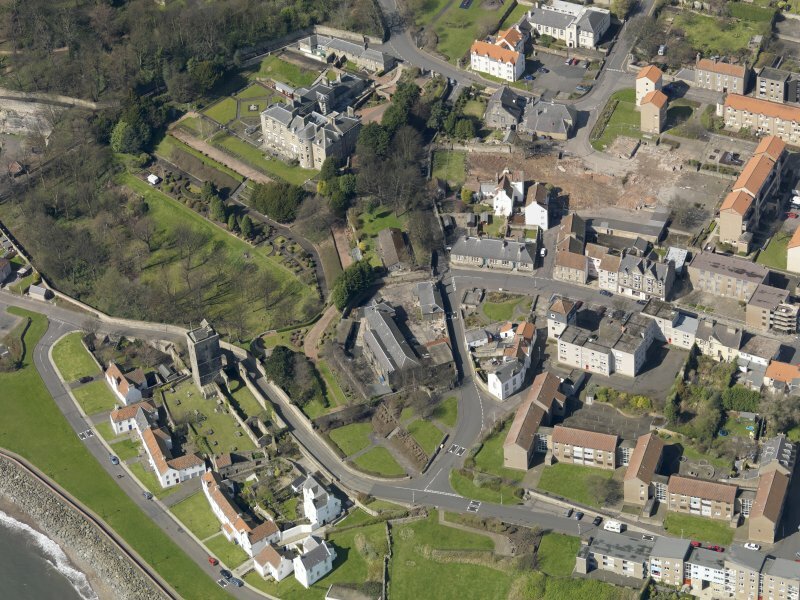 Ten years later the tolbooth charter was deposited in the Kirk of Dysart. 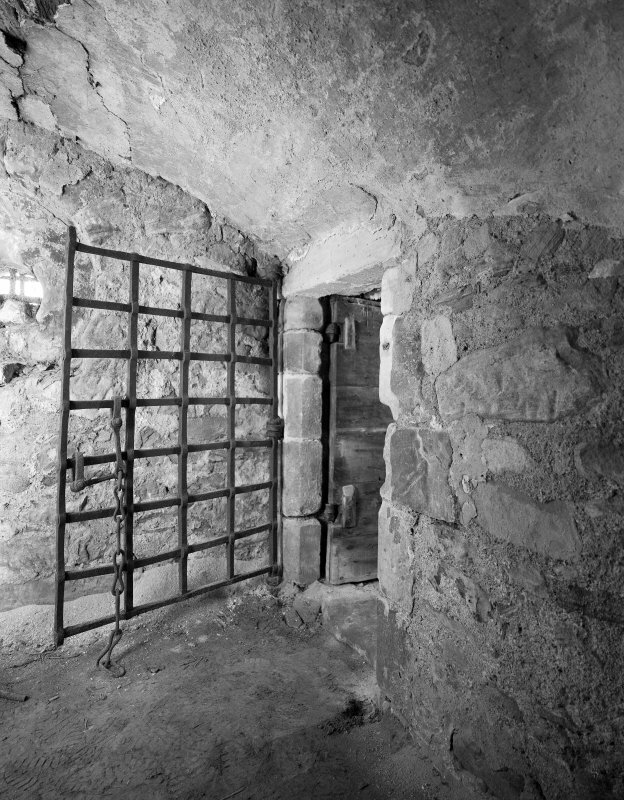 By 1606 the building was in need of major repairs and masons were consulted as to ways of providing an adequate prison. 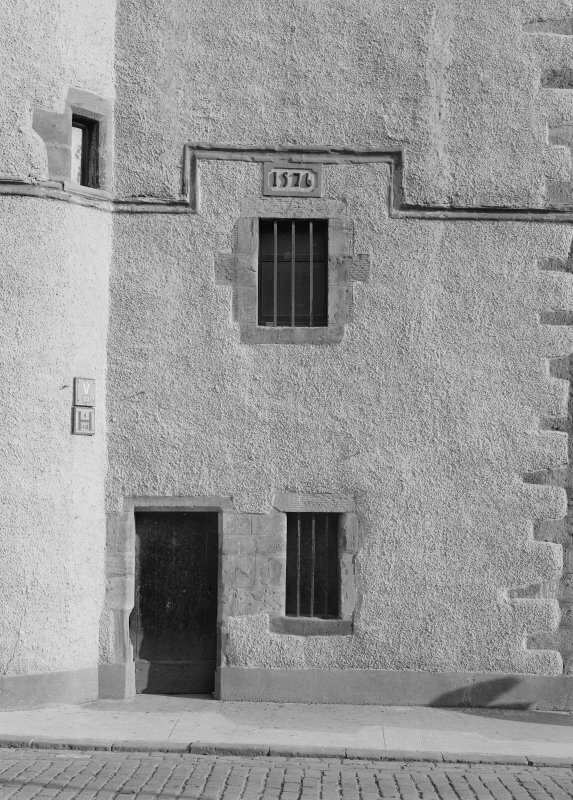 Taxes were imposed to meet the costs but the work does not appear to have been completed until 1617 and this date appears in a panel on the forestair built against the south side of the tower. The upper part of the tower was reconstructed in the 18th century to provide an ashlar bell-chamber covered with an ogival roof in stone. 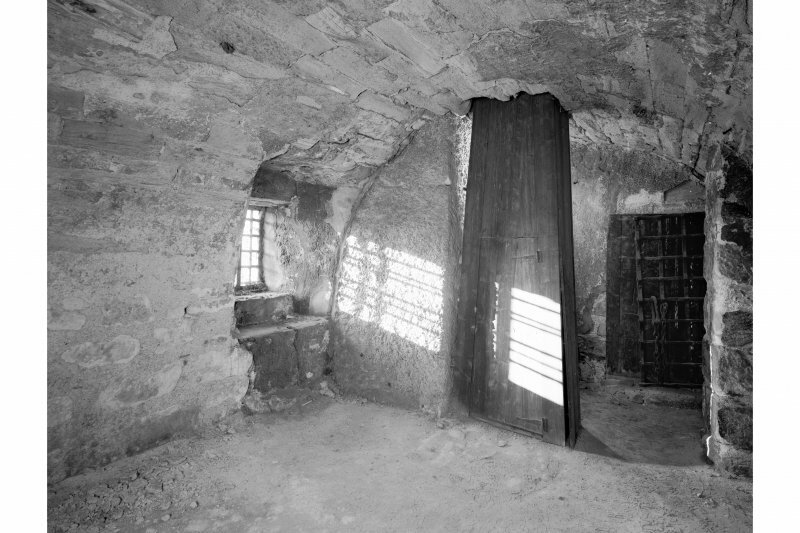 In the 1840s the 17th century prison was still in use and described as 'two rooms in Town House ... dry, but not very secure ... quite unsuitable as a prison'. The building was extended to the east in the 19th century. 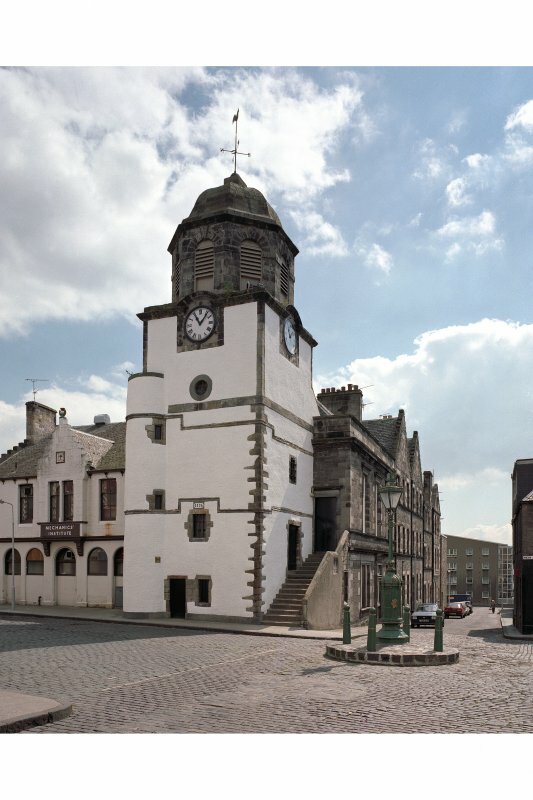 The tolbooth is situated in the SE angle of High Street and Victoria Street, at the central crossroads of the burgh. 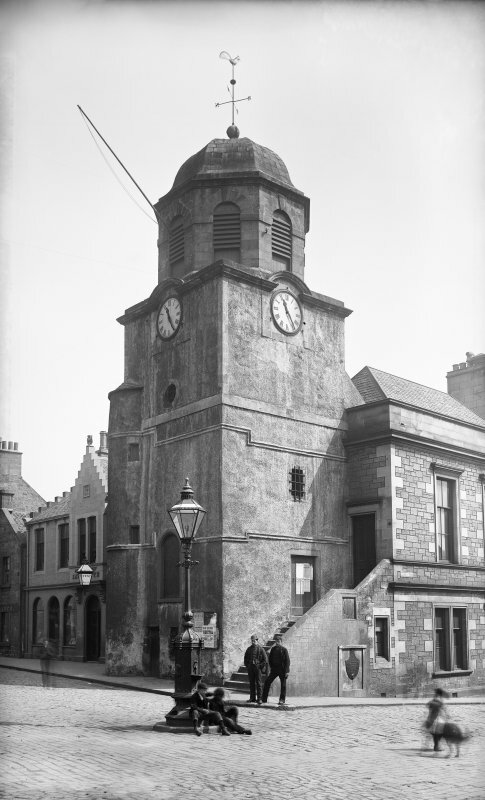 It comprises a five-storeyed steeple with a two-storeyed hall adjoining to the S. The steeple was probably built in 1576, the date that appears on a panel reset in the main (N) front and is confirmed by local records. Its upper stages, and the octagonal belfry, date from 1743-4. The hall was rebuilt and enlarged, to designs by the Glasgow architects Camp bell Douglas and Sellars, in 1885. The steeple is rectangular on plan, measuring 8.3m by at least 6.5m. With the exception of the ashlar-built belfry, it is harled and has dressed margins, with stepped quoin-stones and moulded string-courses up to third-floor level. An early photograph showing some harling removed at first-floor level indicates that the masonry is of coursed rubble. A forestair gives access to the first-floor entrance-doorway in the W wall while an extruded stair-turret at the NE angle rises to the third floor. The forestair and doorway appear to have been rebuilt in the early 17th century. A panel carved with the date 1617 and a shield bearing a stylised tree is set into the W wall of the forestair. The upper stages of the tower, as rebuilt in 1743-4, have plain ashlar margins and string-courses, and terminate in a heavy wall-head cornice. The clock-faces are set in square surrounds 'with segmental heads which rise into the cornice, and the octagonal belfry has round-headed louvred openings with slightly projecting keystones. It terminates in a cavetto cornice which carries an ogival stone roof with concave facets. Up to third-floor level the rooms are rectangular on plan, although the ground-floor one has been curtailed by extensive blocking at the S end. This room is entered by a doorway in the N wall and has no communication with the upper floors, which are barrel-vaulted. 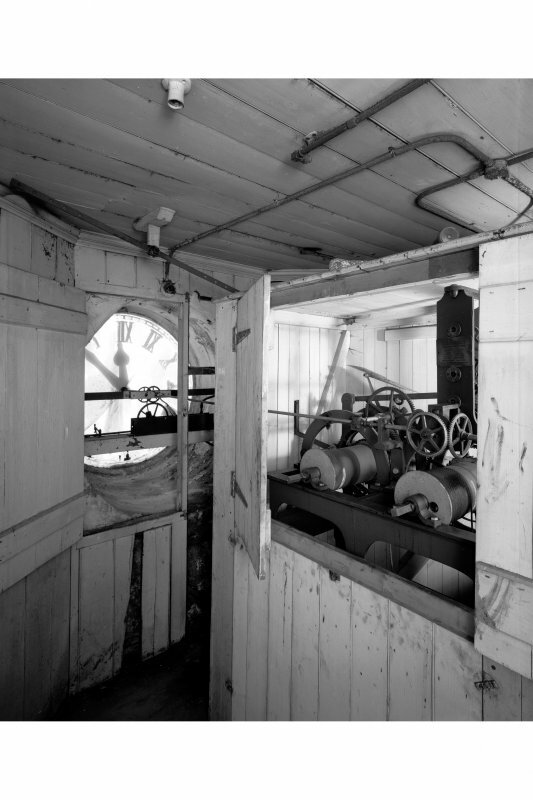 From the first floor upwards, each room has access to the stair-turret, and in the NW angle there is a rectangular shaft for the clock-weights. The walls and vaults of these rooms were covered with coarse render, much of which has disintegrated. 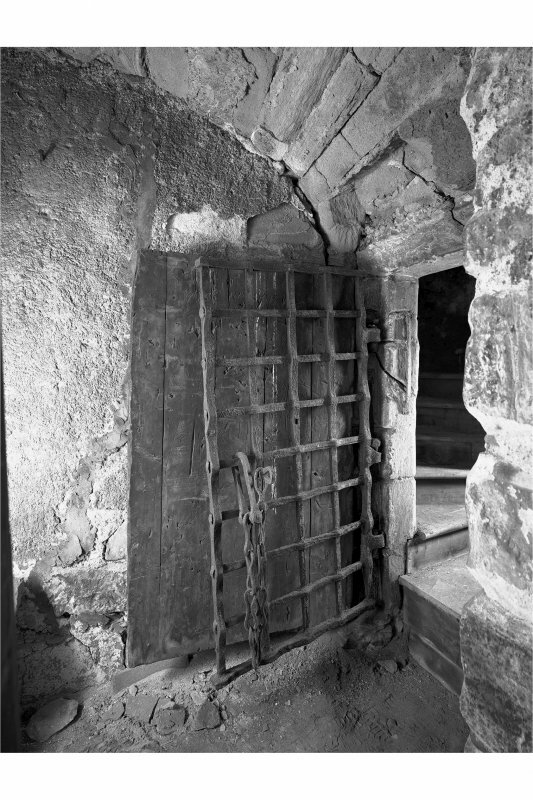 Few original fittings survive, but there are iron yetts to the doorways of the second-and thirdfloor rooms, the latter still retaining its inner wooden door. The provision of a new clock was discussed in 1825, but the existing one was made in 1876 by Hand R Miller of 238 Edinburgh, at a cost of £110. The belfry contains two bells, one of which is of late medieval date. 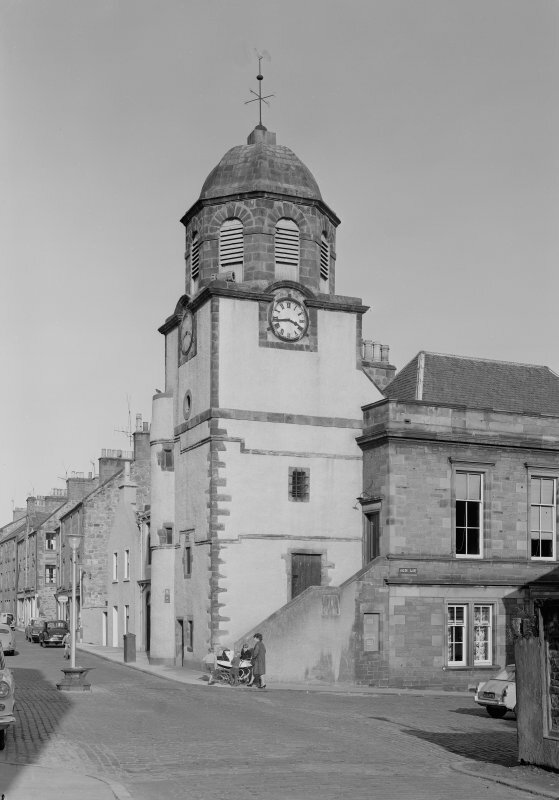 In 1808 it was proposed to replace the old church bell, which was broken, and the town-house one which was too small, with a single large bell to be hung in the tolbooth steeple ' as the most central situation'. The new bell, which measures 0.9m in diameter, was cast by Thomas Mears and Son of London, and bears the names of the burgh magistrates and officials for 1808. The medieval bell, 0.64m in diameter, was evidently intended for ecclesiastical use. It bears a black-letter inscription, with the words divided by symbols including an initial cross and a crown: PRECURSOR D(OMI)NI DEI NOBIS GAUDIA [ ... ] ('the forerunner of the Lord God [ .. . ] joys to us'). Kirkcaldy Museum houses some items believed to have come from the tolbooth, including a marquetry panel of a ship dated 1613, a large key and various weights and measures. 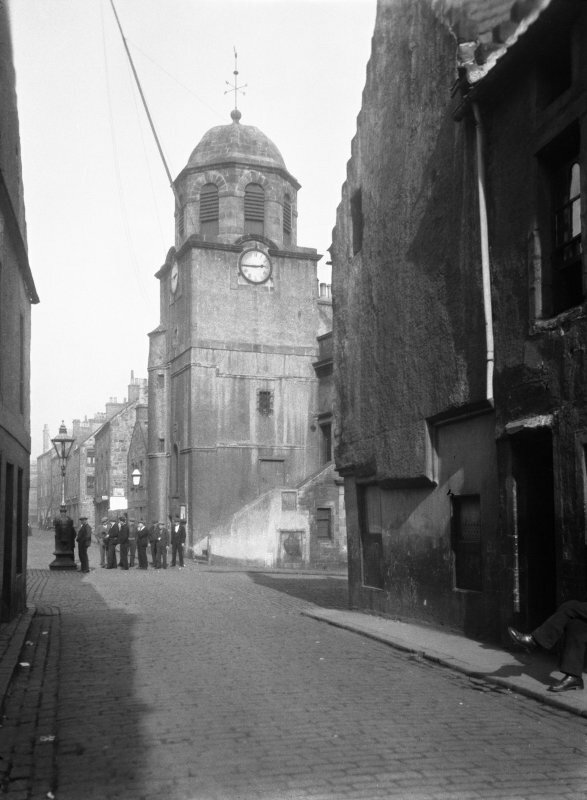 A previous tolbooth, 'devysed on the hie gate where the mercat croce stude', was built in 1567 but appears to have been demolished in 1575, when a new site was found 'on the south side of the hie gate ', where the present building stands. Repairs were undertaken in the early 17th century, when the forestair was built. Major repairs were also required after an accident in 1656, when Cromwellian troops used the steeple as a magazine and inadvertently caused a gunpowder explosion which blew off the roof. The building appears to have been in a damaged state for a long period, while further repairs were required in 1707-19. 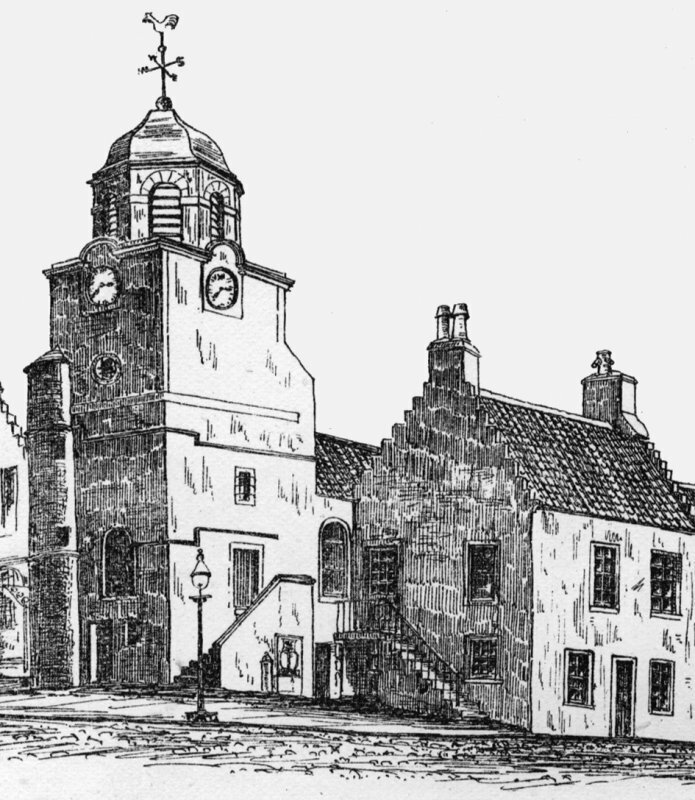 In 1743 Lord Sinclair, owner of Dysart House, 'influenced Mr Douglas architeck to come and look at the Tolbooth, and who has drawen ane draught or scheme how it should be repaired'. This was presumably the Edinburgh architect John Douglas. The upper portion of the steeple and the belfry were rebuilt in 1743-4 at a cost of £499, the mason-contractor being Alexander Mawer, one of the council. 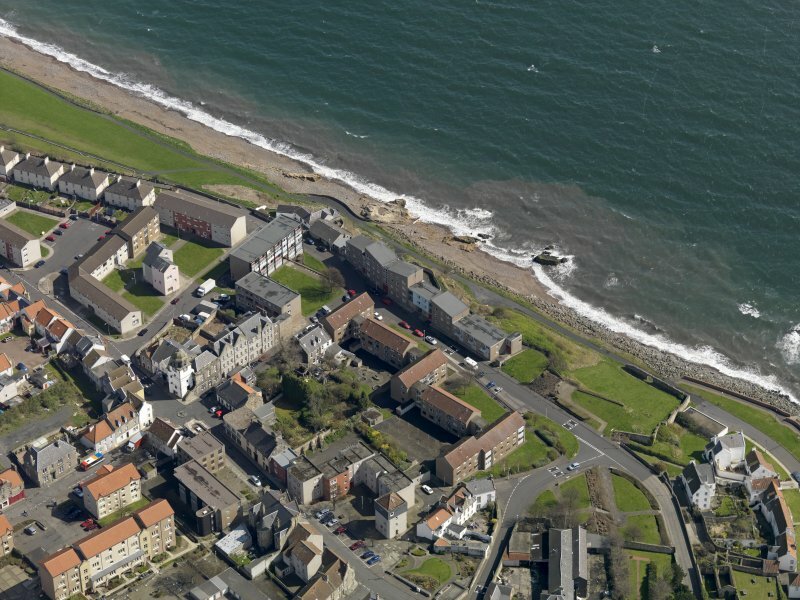 The building fulfilled a variety of functions, including a hall for the magistrates and council, a prison, a public weighhouse, guard-house and 'black hole'. A room adjoining the council-room was leased as a coffee-room in 1811 , and a library was housed in the same room in 1815. The council house had been enlarged in 1765 by ' extending the partition as far as the arch of the pend', to make it more suitable for business and for public entertainments. The physical evidence of this, and of the main block as a whole, does not survive, having been replaced in 1885 by the present town hall to the designs of Campbell Douglas and Sellars. Some time after 1934 a large round-headed first-floor window in the N wall of the steeple, which was probably an early 19th century insertion, was replaced with a smaller lintelled window of traditional character.